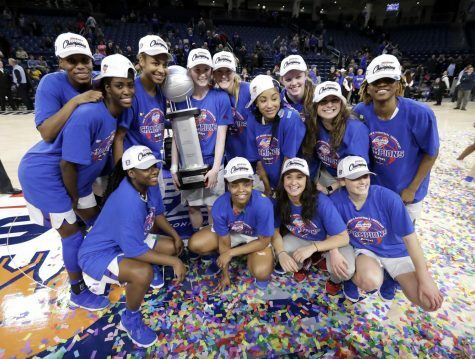 DePaul (26-7; 15-3 Big East) added another milestone to its already fantastic season on Tuesday night by running all over the Marquette Golden Eagles (23-9; 15-3 Big East) 98-63 to win their third Big East Tournament championship in the last five seasons. Senior guard Amarah Coleman poured in a career-high 27 points on an efficient 9-of-13 shooting from the field in route to being named the tournament’s Most Outstanding Player. In fact, Coleman, knocked down five of her seven 3-point field goal attempts and also dished out five assists. Offensive production was plentiful for the Blue Demons from tipoff, as they shot 51.4 percent on 38-of-74 shooting and maintained momentum by consistently playing a fast-paced full court transition offensive scheme. Consequently, the Golden Eagles struggled to keep up with the Blue Demons and with 5:39 left in the fourth quarter, the Blue Demons led 91-51 to put the scoring margin at 40 points, which was their largest lead of the night. Millender dropped 16 points, including four 3-pointers in the second quarter, and redshirt junior forward Mart’e Grays dropped 14 points. Coming into the game, the Blue Demons emphasized the ability to stay focused in order for the game to come into its own. “I thought we were really focused and just ready to play and when we focus and energize like that, (then) the team chemistry just builds and builds and that’s what we feed off of,” Grays said. A huge part of DePaul basketball is knocking down 3-pointers, and the Blue Demons were superb from behind the arc en route to knocking down 45.7 percent of their 3-point attempts for 16 conversions. The Blue Demons’ ability to make 3-point shots proved to be costly for the Golden Eagles. “They have five people on the floor that can hit a three at any given time, and when that happens and the way that they space the floor, and the way that they cut and they move, it’s really hard to guard,” Golden Eagles head coach Carolyn Kieger said. 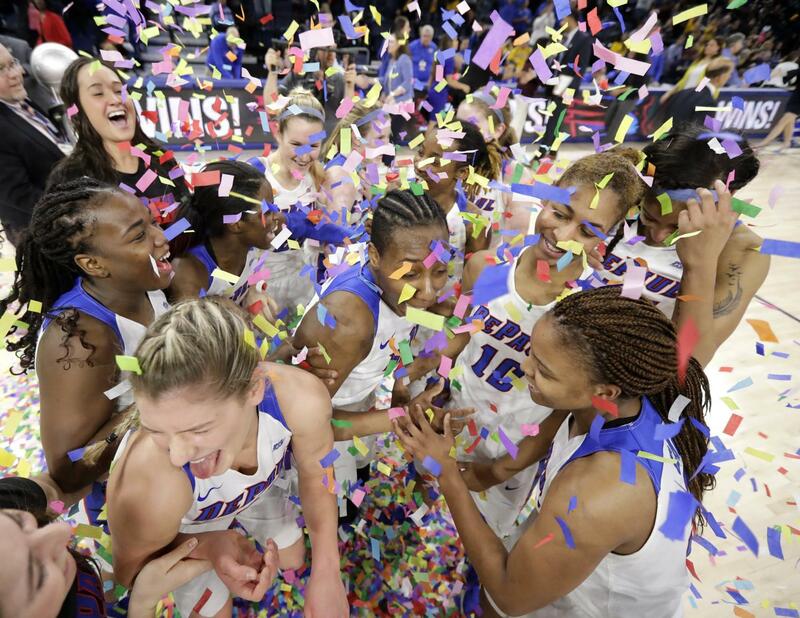 For the third time in five seasons, DePaul won the Big East Conference tournament with a 98-63 win over Marquette, avenging a loss in last season’s conference title game. Equally important, excellent man-to-man defensive play was key in the Blue Demons’ victory as they held the Golden Eagles to just 34.7 percent from the field and 28.0 percent from deep. 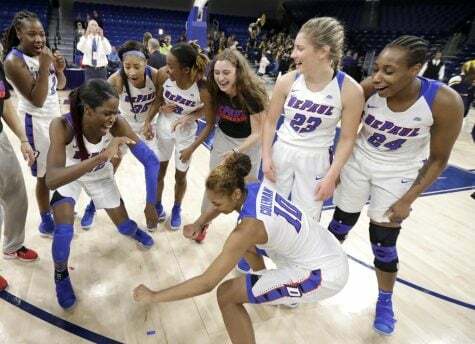 Additionally, the Blue Demons dominated the boards and pulled down 52 total rebounds, 40 of which were defensive rebounds, and kept the Golden Eagles off the glass by limiting them to grabbing 34 total rebounds. As a result of playing good defense and racking up defensive rebounds, the Blue Demons were able to open up the floor and make timely passes that positioned them to taking numerous high percentage shots. Namely, the Blue Demons finished with 27 assists while the Golden Eagles finished with only 11 assists. Accordingly, the Blue Demons scored 23 fast break points and 44 points in the paint. “I think we did a good job of really finding our teammates in fast breaks today and getting assists there,” Campbell said. Perhaps the most notable impact of the Blue Demons’ defense was their success in shutting down Allazia Blockton, the Big East Player of the Year, and holding her to scoring just eight points on four-of-11 shooting, which is well below her season scoring an average of 18.7 points per game. With the Big East regular season championship and tournament championship scratched off their bucket list, the Blue Demons now look onward to Selection Monday where they will learn their NCAA tournament seeding.